Bright lights, big city. 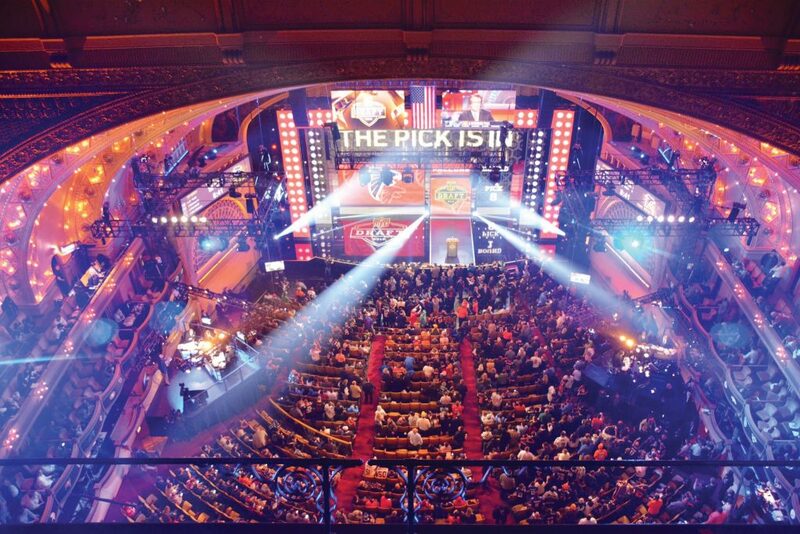 Opening night of the 2015 NFL Draft drew 4,000 fans inside the Auditorium Theatre and nearly 200,000 more to Chicago’s Grant Park and vicinity, and that was only the tip of the iceberg for the major TV event watched by millions. As the bright lights of the 2015 NFL Draft bathed Roosevelt University’s Auditorium Theatre in swaths of pink, purple and blue and the 4,000 fans in attendance roared approvingly, Edward Weil beamed with pride and emotion. He knew millions of people all over the country were getting a look – many for the first time – inside the architectural gem that his great-grandfather, Dankmar Adler, had designed 125 years prior. A touchdown for Roosevelt. The event generated spending, jobs and a can-do spirit of hospitality exhibited nightly by volunteers, many who came from the Roosevelt University community. 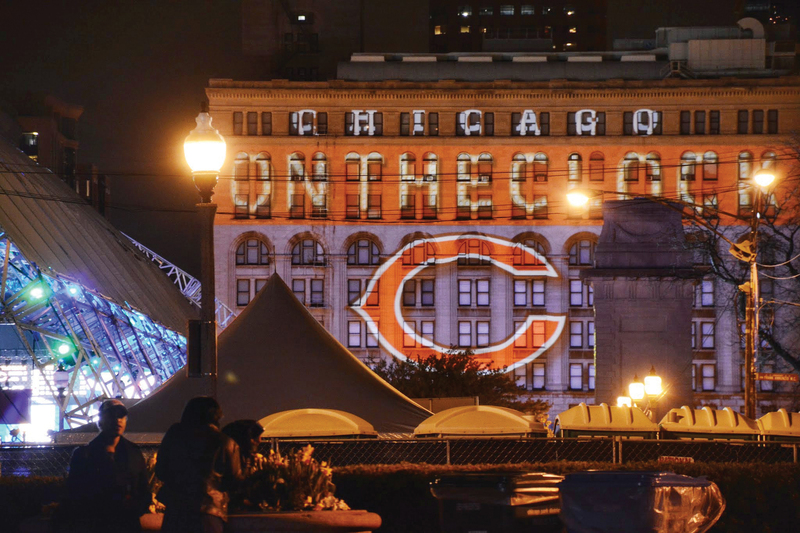 The Auditorium Theatre and Roosevelt University began preparing for the Draft in earnest on Oct. 2, 2014, when the NFL announced that Chicago would be the first city outside of New York to host the Draft in half a century. C.J. Dillon, chief operating officer for the Auditorium Theatre, credited Chicago Mayor Rahm Emanuel for leading the charge in bringing the NFL Draft to Chicago. “It took determination, vision and imagination to make an event of this magnitude possible,” he said. “We had people from all over the University involved in making sure things ran smoothly,” added Dillon, who co-led a Roosevelt team that worked with the NFL, Chicago Sports Commission and the Choose Chicago tourism bureau to make the mayor’s dream a successful reality. “Our goal was to be welcoming and accommodating, and we did it as a community in a national spotlight that showcased our friendliness, dedication and capability,” he said. 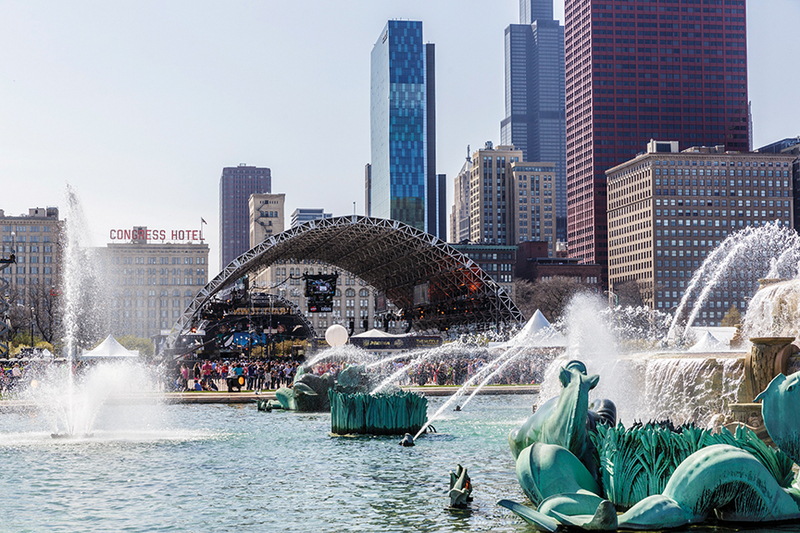 By all accounts, the Draft, which drew fans from around the country to Chicago’s lakefront, was a huge success in both the way it was presented and in the publicity it attracted. Dozens of writers, broadcasters, photographers, camera crews, bloggers and tweeters reported on the Draft from the Theatre and the press interview room, located in Roosevelt’s second floor Congress Lounge. 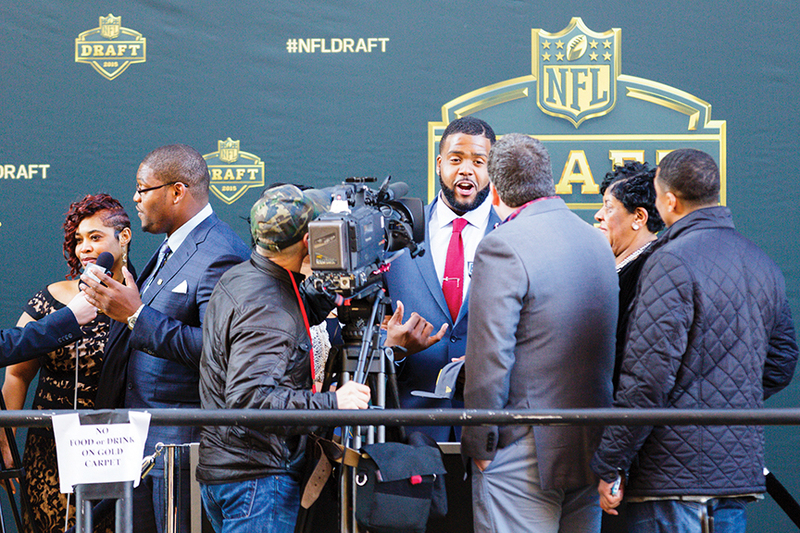 Approximately 50 million people tuned in during four days of Draft coverage, including 8.8 million viewers who watched at least three minutes of opening night on ESPN or the NFL Network. In addition, approximately 4.7 million people tweeted about the event, making it among the top-tweeted sports events of all time. “We put on a show and made people happy, which is what my job is about – just not normally on that kind of scale,” added Dillon. One of the many details was a platform erected on the back section of the theatre’s stage that was used as a Green Room where top players and their families waited until the players were selected. After being drafted, the future NFLers donned their new team’s hat and crossed the famous Auditorium stage to shake hands with Goodell. Before the show could be transmitted to the viewing public from ESPN and NFL Network broadcast booths erected inside the theatre, there was need for a powerful bandwidth capable of uploading data to multiple mobile devices at once. Neeraj Kumar, the University’s chief information officer, began working on the technology piece in January and recalls as many as 50 walk-throughs with the NFL, ESPN and various cell phone providers. The end result was a three-fold increase in bandwidth at the University and Theatre which remains in place after the event. The technology improvements were made courtesy of the NFL and Choose Chicago. The Auditorium, which opened in 1889 as the first multi-use building with electricity, continues its cutting-edge tradition as a venue that can host complex, major media events. The “brick-and-mortar” improvements, however, pale in comparison to Roosevelt’s biggest asset – its community of people who were everywhere putting the University’s best foot forward during the NFL Draft. 3 days 200,000 attendees. 8.8 million viewers. 4.7 million tweets. Directing people at the second-floor connection between the Auditorium and Wabash buildings was College of Arts and Sciences Dean Bonnie Gunzenhauser, who said she couldn’t miss the opportunity, even though American football and her love for English literature rarely intersect. “I like football and I love spectacle. I wanted a front-row seat to some of the drama,” she said. Roosevelt volunteers weren’t limited to the Auditorium Building. 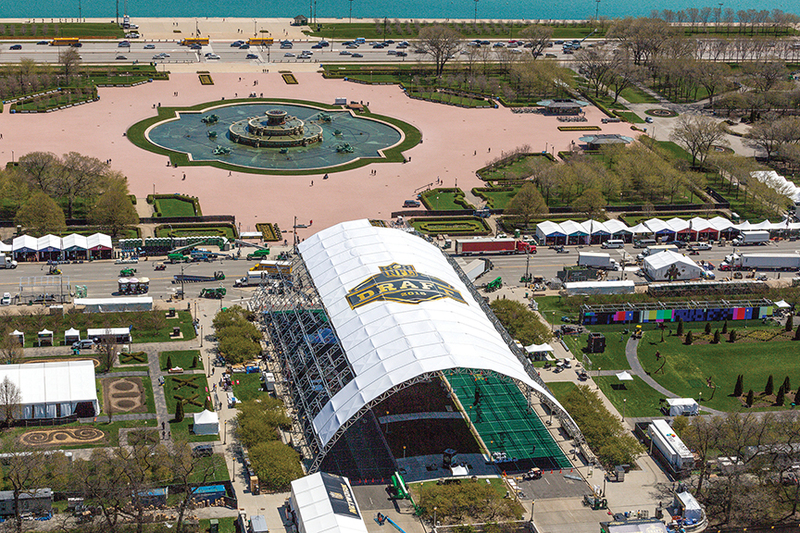 In fact, many were selected by Choose Chicago and were stationed at the NFL’s gigantic outside Draft Town festivities, located just east of the Auditorium Building. “I’m working longer than they wanted me to because it’s just so exciting,” said Ester Rogers, Roosevelt’s recent assistant provost of institutional research and assessment who handed out fan bags at the NFL’s Selection Square, and actually got a few hugs from the fans. “I think we put on a fabulous party,” said Kristina Peterson, associate professor of counseling and human services in Roosevelt’s College of Education. She spent opening night volunteering in the NFL’s VIP hospitality tent and a second day with fans in line for the Vertical-Jump challenge, an assignment she won’t forget as she got to interact with youngsters from a pee-wee football team and a grandmother taking the challenge on a whim. 32 teams. 900,000 square feet. 36,576 hotel rooms. 846 new jobs. Pride was something that Weil felt as he watched the opening-night extravaganza that put Chicago, the University and its theatre into the limelight. I was fortunate to be able to work the Draft both in 2015 and 2016. It was an experience of a lifetime. The atmosphere in the Auditorium Theater was electric. Fans from all teams cheered as their team was “On The Clock”. As a member of the Roosevelt Community, I have never been prouder of my School, my Theater, my coworkers and my city. Thank You NFL, for making Roosevelt University and Chicago your first and second round Draft Picks in 2015 and 2016.
i am very happy and proud to read about this outstanding event. go alma mater! charles e donegan ,bsc,ru,1954.